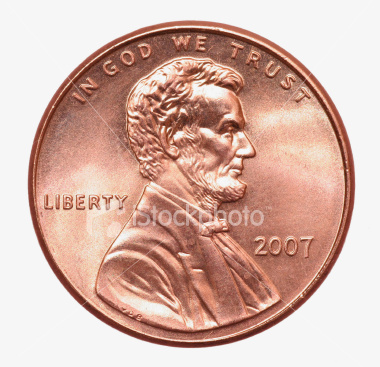 A penny for your thoughts! Before we get rolling….our prize winners from the tour! Chosen by Random.org…Lisa808, Joanne Gilch, and Melissaward! Please email info@operationwritehome.org, and we’ll hook you up with your prize! Is anyone else just basking in the creativity of the blog tour last weekend? If you missed out because you were out of town, you can still go be inspired – just click here to go to the start post. You may need to scroll down on some blogs to get to the actual card shared in the thumbnail, since people may have posted the main blog url rather than the post url. Ginger said…OWH is wonderful, connects so many people in the world… shows what a group of love, joy can bring to the many faces of our world. Noelle’s Corner said…I like OWH, because it helps keep families connected and form friendships. Lisa of ML Design Works said… I enjoy OWH because I love to make things for people who need them–and this gives us an opportunity to fill a need. It is a great organization! Our Little Inspirations said… I love OWH because there are so many generous volunteers who care enough about those serving our country to give something back on a personal level. It’s a great organization with fabulous participants! Marlene D said…I recently discovered OWH and love it because it answers the question ‘what can I do… I’m just one person?’. One person and another person and so on can do a lot to support our troops. Sandy said…What I love about OWH? Our heroes and our cardmakers! Marianne said …What I love about OWH – of course the OWH family but the fact we can touch the lives of our service men and women. Dee B. said…I love everything about OWH! All the talented people coming together for a great cause and knowing that somewhere there is someone who loves a handwritten card from their loved one deployed more than any other item in their possession. I still have all my hubby’s letters he sent me! Rufus said…OWH is a truly marvelous organization of caring, giving, friendly folks. It’s my way of showing the troops that I support them and appreciate the sacrifices that they and their families make for all of us. If you think that one person can’t make a difference all you need to do is read some of the letters written to OWH. Be warned it’s best to have a box of tissues by your side while you do this! My short answer when someone asks this question, given today’s age of email, twitter, facebook etc. is yes, but how many people print out an email and keep it in a box under the bed???? There is still something special about a handmade, handwritten card. 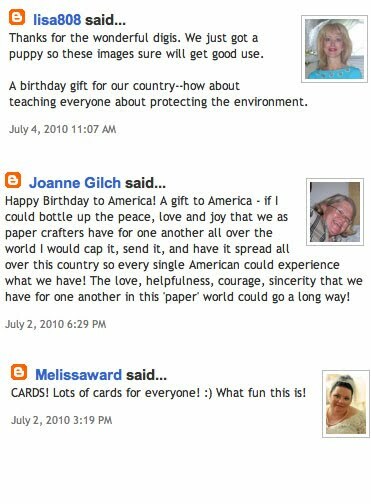 Songbird Cindi said…I just sent my first box of cards to OWH because I’ve had family and friends who have served. It’s so important to be able to send something tangible to your loved ones back home. Jessica said…I love OWH blog hops/tours & what y’all do. Hubby has served over seas 5 times in 10 yrs & it brings a smile to my face & touches my heart that so many wonderful people support total strangers they way you do. Thank You. rstuck2003 said… I LOVE OWH because it gives the wonderful men and women serving our country a chance to send their loved ones back home a card to let them know they are thinking of them. It allows them to know that we back home have not forgotten about them! Debb said…OWH-such a great organization with a wonderful mission! I love to make cards and how much better to tailor my cards to use them to send to OWH! Isims said…OWH is great because it encourages service men/women. They deserve all the help and encouragement possible. Grandmalee said…I love OWH because they care for our soldiers which my daughter happens to be one. She is a MP with the CO Army National Gurad and spent 18 months in Iraq, so I know all too well what these cards mean to our troops! Thanks for participating! Dixie C. Said…I love OWH not only for the mission but for the community we have managed to achieve online. LOTS of new friends! Diane L. said…I’m just learning about them in the last few months and am thrilled at the amount of selfless giving. Stampers are indeed very special. Jengd said…I love that people are willing to share their time and efforts making something to share with someone they will likely never meet. In return, that person will be able to share something they normally couldn’t with their loved ones. What a great organization!! Susan said…I have many reasons I love OWH. 1. it is the very least thing any crafter could do for those fighting for liberty and freedom, and helping to right some wrongs, bring back humanity to places where it is long been missing. 2. for myself, being disabled and being without a car (and sooo missing my work, I loved my career) This gives me a purpose, this makes me feel like I have a “job” and an important job at that! Theresa said… Love what OWH does for our servicemen. Shirley said… I think if I were a wife or a mother or even the child of a serviceman to receive a card that he or she had sent to me would give me a physical link to him that no phone call or e-mail can do. I love knowing that OWH helps to provide that link. Jamie said…I love OWH because as a former military wife (my husband honorably discharged in 07 from the Air Force) I know how much small things like letters home can mean for our service men and women and their families and I love being able to give back. Thank you again for featuring me on the S&S blog. It was a thrill to see my cards online! Not only do you give to the troops, you also give to your cardmakers. I’m proud and happy to be one of them! Hope you’re all feeling the love, too! If not, go to the hero blog, we’ve had some absolutely wonderful emails and cards and letters sent in the last few weeks. Take kleenex with you! We tried a different format for the “blog tour” vs our regular “blog hops”….and from what we can see there are a few pros and cons of each. Please read this and let us know which you prefer via a comment (or an email to info@operationwritehome.org if you’d rather make a private comment). Blog Hops: For these events, we take pre-signups; bloggers are each sent a link to the following blog, so as hoppers go through, they click straight through from one to the next. Pros: People tend to look through all the blogs, not skip over any. Seem to have more comments made per post. We also have a better idea how many blogs will join in since we have signups. Each blog is a “surprise” as hoppers go through; since there are no thumbnails, it can be a delightful “ooooooh” to be found around every corner! No spam, since we check out all the signed-up sites ahead to be sure they’re cardmaking blogs. Cons: Getting everyone coordinated and posting at the right time is a bit of work. There’s a bit of pressure to be sure to post, and if someone drops out, we coordinate skipping over them in the order. And if you don’t sign up ahead, you can add a post at the end, but those don’t get many views. Blog Tours: For this event, ie this past weekend, we did not take signups ahead. Everyone added their link via InLinkz once the tour post went live. Pros: No pre-signups – less pressure. Can post anytime, no urgent need to have everyone start right away. Thumbnails available right away. People can also post several times throughout the hop and add more cards, more candy. Cons: Fewer comments per blog post; people skipped around based on their interest in the thumbnail posted. We noticed a lot of people leaving a lot of comments for others asking them to come enter for blog candy; not sure if that meant people were unhappy with the number of folks viewing their blogs or not. We also had to weed out spam sites as they appeared, since InLinkz accepts anyone who adds a link. Just my two cents but I thought that the blog tour got a lot less attention (I only had 29 comments vs. the 129 from the last blog hop.) There just seems to be more build up for a blog hop and the format is more well known. I'd prefer to be involved with blog hops in the future. I enjoyed the tour very much! As to which one hop or tour I liked better? I have mixed thoughts! I like the tour because I did not feel so much pressure to get it finished in a certain time span. I left comments thru #121 over the holiday weekend and felt I could do it as I had time (holiday weekends are hard to squeeze time out of!). I also liked that there were short posts and not the same pitch over and over like we see in the hop (not that it's unnecessary but sometimes the wording is almost identical in the hops making people want to scan the entries rather than read them). I was curious about the comments. My card was posted very early and I did get a larger number of comments than some of the later postings. I did not offer candy this time and I was curious whether or not people would still leave comments and I must say I was thrilled to get so many!- OWHers are the best!!! !I thought it was easy to just go numerically to view the cards. On the other hand, at a couple of points, it was a bit confusing because there seemed to be a private hop in the middle of the tour. Not sure what happened there.As to a hop- love them too! But- it is major work for the setup of it on Sandy's (and maybe others) part. I do happily feel the posts for the hops are more in depth and add more personal insight. And I do believe we most likely get more people motivated to join in with OWH on a hop – more word spread about the organization – more new people inspired – which is the whole point after all.So in conclusion, I think we need both! And perhaps some thought needs to be given as to having smaller hops – perhaps somehow limiting the number of participants (don't hate me for this comment but I do think it can be overwhelming as it has grown!. Perhaps a rotating basis for the featured lineup (of course we could always support the hop on our own blogs by posting about it, perhaps even making a card with the theme, etc, without actual participation in the line up! ).Are you sorry you asked yet??? Thank you as always for all you do! People probably don't realize how much work goes on behind the scenes for a blog hop, but I do think they're better than the tour. I still haven't gotten all the way through last week's tour, though I still intend to. I think part of the reason people skip around is all the having to go back to the main page to get to the next link. And since the thumbnails are there, it's natural to try to squint at them for a preview. With a hop, people go directly to the next one regardless of the type of card pictured. Wow, that's a good question! I wasn't able to play along with the blog tour, but I was able to make a card for the Memorial Day blog hop. I liked the actual blog hop because of the structure… It was exciting (it was my first blog hop with OWH), and like an adventure to hop through everyone's blog to see what they made (and if there was any blog candy! LOL 🙂 ) But personally, I was less apt to hop through the tour because it was less pressure, I guess. 🙂 You could go if you wanted, and look at the thumbnails on Mr. Linky, and see from there. The hop was a surprise every step of the way! I love that aspect of it. That's the long way of saying that I think I like Hops best. 🙂 But I'll go with whatever you decide – I really am enjoying OWH! I liked both. The tour was nice because of no broken links. I'm sure it has a great advantage too because there's very little set up compared to a hop. I guess I'm not like a lot of people because I did go straight through. I thought it was very easy to navigate. I didn't like how you could post twice (or more) because I had already read some of them and it was redundant … and I'm saying this as somebody who posted twice! I also agree with the previous commenter that the private hop in the middle of the tour was pretty confusing. Hops are nice because you do have more build up. People tend to put more effort into them, it seems, and it really pays off with the comments too. I also like with a hop that you can post any time, and as long as you have the link to the next person you're OK. I wasn't home for the first day of the tour and so couldn't add mine to the InLinkz until late that night, even though my post was up and some people found me on their own. But again, if you're comparing the amount of work put in, hops definitely are more involved and that needs to be taken into account because all the OWH leaders do so much already. I can't imagine how you gals get it all done normally, much less when a hop is added on!Conclusion – we should do both. Maybe one big hop a year and several smaller tours. I agree they both have their pros and cons and it would be great to find a way to combine the best of both but that may or may not be possible. Of the two I probably would say I prefer the hop style though I think the tour was actually a bit easier to navigate (no searching for the next hop link) and no dead ends. Not sure I liked the multiple posting option, I think I just prefer to see as many different blogs as possible in the time I have to devote.I would like to point out however, that the fact that the Blog Tour followed the Blog Hop so closely may have had an effect on the level or participation and commenting. I know that I for one did not do nearly as elaborate a post (not enough prep time to put much thought into candy, freebies or tutorials) as I have in the past for hops.Either way, I think it's safe to say I'm an OWHer for life. It's nice to interact with other card makers via hops/tours but comments are just icing on the cake for me. It's all fun and it's all good! I actually like both setups. Either way though, what I do like best is being able to look through the persons blog and see more of their work. I do enjoy making comments, but had a problem with it on numerous occasions not accepting my comments. So, I've decided to start a blog and will soon start posting to it and then I think my posting issues will be resolved. The tour was nice because it was easier to remember where you left off. The hop is nice because it is fun to jump "sight unseen"! I really enjoyed the blog tour, I found it much easier to "hop" at my leisure because I could go back to the thumbnails and continue from where I'd left off.I had 446 visitors to my blog from the start time Friday to 8 AM Monday morning, I was stunned at the amount of people that came through. I think I had about 130 comments left for 2 posts so that was nice. I enjoyed "touring", I try to leave a comment at each stop. I did get frustrated with the word verification that would pop up so I just clicked off of those blogs toward the end. I have now attended both and have to say as a newbie to blogging and hopping, I found the tour much easier to both navigate and to participate. I don't always have the time available to know in advance if I can participate so with the tour I got to jump in and make my card (even though I was at the very end). I also had the chance to view all the blogs in segments and found it very easy to find where I left off. AND if there were a few I wanted to go back and view I didn't have to hunt for it, I could just use the thumbnails.I know lots of work goes into organizing these events and they are so appreciated. As far as comments, I was at the very end of the tour and was surprised to see I had 14. Woo-Hoo! Most I've ever had, in total even since I started the blog!Either way you do it should be based also on the level of work and other commitments that the organizers have on their plate. I am just very happy to be able to play along.Thank you for all your hard work! I myself prefer the tour because I felt less rushed trying to get through as many as I could. I found myself commenting less on the hop than the tour. Whatever is easier for everyone, it doesn't matter to me. I do enjoying getting comments but I got about the same amount from both. I didn't participate in the tour.. but I definitely prefer the hop! I like being able to click to the next blog from each blogsite rather than clicking on a thumbnail, going back to the page and clicking again. I vote for Hops!! I like both formats although I found it harder to navigate the tour. With the hop I just hopped merrily along in the order intended. With the tour I started at the beginning. Took a break and started at the end working backwards. I'm sure I missed some in the middle. But I know I can still access that info so I can go back at my leisure and have another look. I'm happy with whatever you do. I wonder if it is possible to to a sort of self-guided trip using the forum as the organizational tool. Participants could each post their intent. Then when the list of participants is complete (as signified by a cut off time) all participants could copy the link of the person after them and add it to their blogs (hop style). I doubt I explained that clearly but i think it could work. When it is time to start just post the first stop on the Facebook page and in the S&S blog. No work for our dear shippers who do so much, except to pop by during the blog fest and cheer as desired. I'm new to OWH but I would prefer the Blog Hop … much easier to go from one to another. I would love to participate in one! I prefer blog hops! I didn't see where many people participated in the tour! I was one of the lucky winners–thank you! I just send an E-mail with my mailing info and thoughts on the two different ways of organizing the hops. My comment is from one who takes the hop or tour for enjoyment and inspiration. My biggest problems have been on hops when a link to the next entrant doesn't work. With a tour the link/thumbnail has always worked.I don't pick and choose from thumbnails on a tour… I visit every blog in the order they are listed and it's much easier to pick up where I left off.I do my best to leave a comment at every stop I make be it a hop or a tour. I feel it's the least I can do when someone goes to the time of creating a card for my enjoyment. Sometimes I'm unable to leave a comment because no matter what I do it just won't post. But I have that problem on both the hop and tour.All in all I like them both and will continue to hop or tour because it's so much fun. Thank you again to all the participants and co-ordinators for all their time and efforts. They are appreciated. I personally prefer the Blog Hops vs the Blog Tour. As previously stated, there are pros and cons to both.I noticed my comments were way down, as well as the number of visitors. I really appreciated those who took the time to make comments. They really brightened my day!I did not particularly care for the multiple entries even though I posted two.I prefer the continuity of blog hopping, going through the list as directed. I will participate in either format as I know the blog hop is a lot of effort and coordination for the folks at OWH. Perhaps one or two hops and a couple of tours — spaced out every three months; i.e., Memorial Day, something in August, around Thanksgiving, perhaps Feb/early March.Just thoughts. I appreciate everyone's efforts in putting this together. I was brand new to this wonderful sight, and liked that I could join the tour when my card was ready. When I had to stop, I just jotted down the number where I left off and knew where to start up again. I loved visiting all the blogs as time allowed and tried to leave a comment at each one. I'd love to participate again in either a hop or tour. I prefer the blog hops. I think I am going to agree with Paula on one point-the blog tour followed the actual blog hop by just a few weeks it seemed. I , like many others had devoted much time to the blog-hop and I did not participate in the tour at all -I had thought I would but so many things were going on that I opted out altogether. Perhaps the two hops so close was the reason for less comments 9as some people posted) and it wasn't because of skipping around.